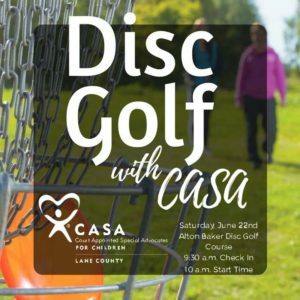 Come throw the disc with CASA! This event is for beginners and experienced Disc Golfers alike! Compete in contests while you play for fun and prizes. Check-in begins at 9:30 a.m. A brief clinic will be held at 10 a.m., with the tournament officially starting at 10:15 a.m. Participants will play 9 holes at the beautiful Alton Baker Disc Golf Course. Tournament will be followed by Papa’s Pizza, Pepsi products from Bigfoot Beverages, and more! Click here to see photos of last year’s event. Get out on the course for a great cause! Registration fee includes lunch from Papa’s Pizza and Bigfoot Beverages at the finish. The first 100 participants receive their very own disc! You may also purchase the option to “Throw with a Pro”, and for $5 you will have an experienced Disc Golfer play the course with you!